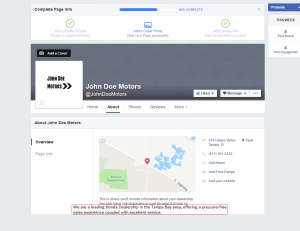 Is your dealership on social media? Let us help you take the first steps to becoming a social media aficionado (professional). 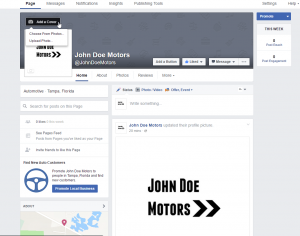 With this visual tutorial, you will be able to set up your own dealership Facebook Business Page that will put you on the road to social media success, drawing in the customers you want to attract and engage with. Social media is social! Let’s get your dealership social. Bonus: In this blog post you will also find a free Facebook Cover Photo template. Click the link below the green SIGN UP button to Create a Page for a business. Click the Local Business or Place image. Fill out your dealership information under the Local Business of Place section. Once you have completed this section, click the GET STARTED button. 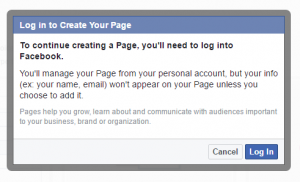 You must be logged in to your account in order to create a Page. 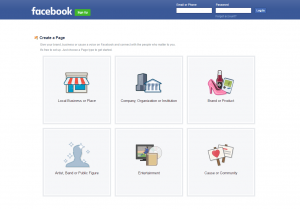 You will manage your Page from your personal account. You can add other administrators to your Page once the Page has been created. 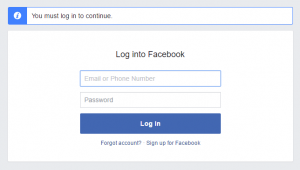 Once you log in to your account, you will be redirected back to the CREATE A PAGE section. 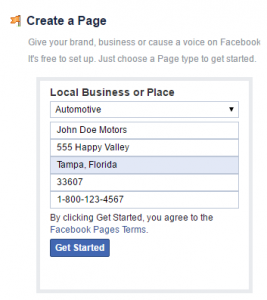 Here you will be creating a short description of your dealership and customizing your Facebook URL. You want to include your website URL in the box below the description. Ideally, it would be best to have the URL match your dealership name. Be sure to also click YES, that your business is a real establishment and click YES your business is the authorized and official representation of your business on Facebook. This is a legally binding statement regarding the authenticity and representation of your business page. Click SAVE INFO and move on to the next section. Upload your dealership logo! You will be promoted to upload the image from your computer of from your website. 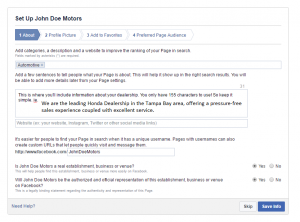 The next section allows you to add your dealership business page to your FAVORITE section on Facebook. You may skip this section if you wish to. 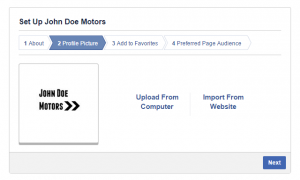 Selecting your dealership Preferred Page Audience lets you reach your target audience in their News Feed. 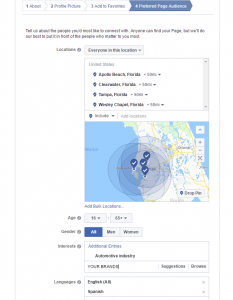 People in the areas that you select are more likely to see your business page. Everyone in the 50+ mile radius of Apollo Beach, Clearwater, Tampa and Wesley Chapel will have the ability to search for this location. You fill this section in by typing in locations closest to your dealership in the ADD LOCATIONS box, directly above the map. Age range is for all people that could be your customer. Gender is best to select ALL. Interests is where you will enter the brand(s) of your inventory, and what your inventory actually is. Select the language(s) that best suit your audience. Once you press NEXT, your business page will be generated. We suggest that you upload a Facebook Cover Photo with the dimensions of 851 x 315 pixels. 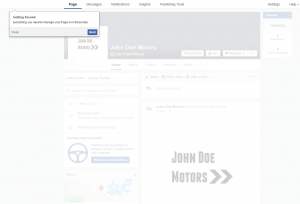 Below this step, you will find a Cover Photo template that you can use to create a Facebook Cover Photo for your dealership. your own free Facebook Cover Photo template. Now we are going to show you how to navigate your new Facebook Business Page! Follow the next few click-through steps to ensure you have everything you need set up. 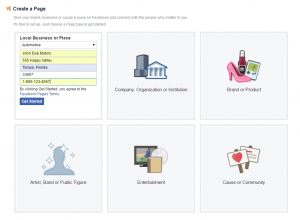 Next you’re going to want to LIKE your own Business Page. This is where you can show support for the work that you’ve done and continue to engage with the content that you will be posting to your page to engage and socialize with customers and future customers. 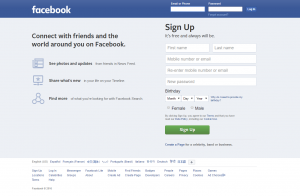 You may also INVITE YOUR FRIENDS from your own personal Facebook page. The more people on your Page, the more activity and engagement there will be for the content and inventory that you’ll soon be posting. 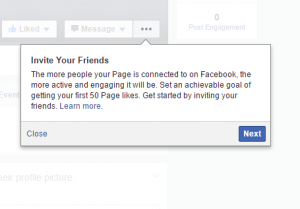 Set yourself an achievable goal of getting your first 25- 50 likes by inviting your friends to like your business! Next, INVITE YOUR EMAIL CONTACTS. 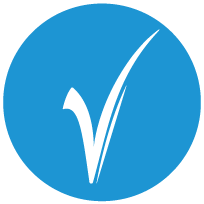 You can upload a contact list file, upload from Constant Contact, MailChimp, VerticalResponse, Gmail, Windows Live Messenger, iCloud or another email service. You can only upload is a maximum of 5,000 contacts at a time. Your Page may be suggested to your contacts who are on Facebook in places like Recommended Pages. If your email contacts aren’t on Facebook, they won’t see your suggestion. You will be notified that your Business Page is complete. You will see a percentage % task bar above, telling you what you have completed on your Page. If you skipped through throughout the creation process, this will be where you can go back and add that information in. we suggest that you click to the ABOUT section and add in your website URL, Hours of Operation and any other pertinent information. Congratulations! You have completed the steps to take your business to the next level by joining Social Media. Click here to follow the LotVantage Facebook page for more tips, tricks and tactics. We’re looking forward to helping you make the most out of your social media experience.